Please Note:- Event Horizon Stage 7 runs very slow on PlayStation2 making it way to easy, so its better to play it on a PSone. EDIT: The slow down was on the original first release of the PS2 (SCPH-10000) and maybe others too, on the latest available PS2 the game now plays fine (SCPH-90006). 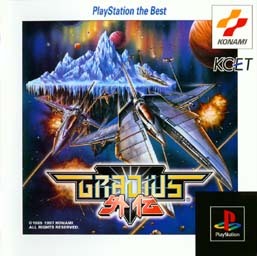 Probably the best Gradius game on any format. You can play two players on screen at once, huge levels with loads of excellent graphics effects. 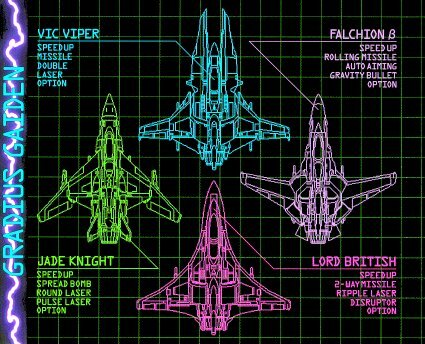 The music for the game is quite unique when compared to other Gradius games, they are long tunes instead of the usual short dittys in the arcade games, levels are huge with lots of the old classics coming back. 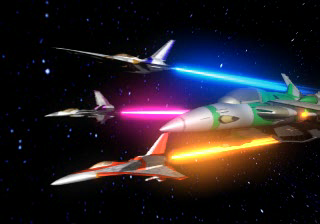 The game starts with a wonderful intro movie showing the four hyper space fighters, Vic Viper, Lord British, Jade Knight and Falchion Beta battling the enemy over the White Storm planet and the flying to meet Bacterian for another round. This an ice world with snow falling and the Aurora lights shining in the background, you get snow slides falling, ice bergs exploding and a huge armadillo type end of level boss. 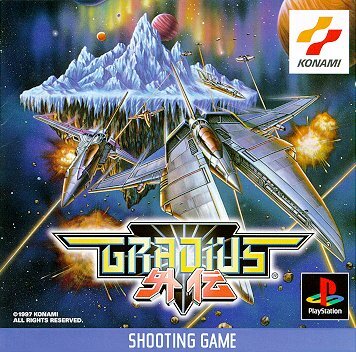 This a true work of genius with lots of the enemies from the previous Gradius games in a graveyard. 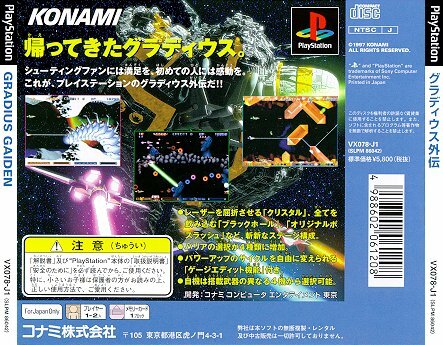 A very good level with transparent crystals deflecting you laser beams all over the place, very large and superbly animated end of level boss with huge colourful laser canons. The best shield is Limit because it makes you totally invulnerable (You can even fly through the ground) Only last a few seconds. Second best is Guard, you cannot hit the ground and it moves round you as you move about. Third best Force Field, but it only takes three hits. The worst is Shield, it may take 15 hits but the enemy always fire after they fly past you making this shield useless. The first warning the announcer gives when you start your mission varies depending on the difficulty setting you have selected. No enemies shoot return of the the after the easiest 2nd lap. The chaser A part of the 7th stage does not shoot the laser. With degree of hardness below this, there is no laser attack of the 1st surface boss (blizzard crawler). Easy - You cannot fail this mission! With degree of hardness below this, the part where the number of appearances of the enemy decreases in all stages. Normal - Crush all of them! Hard - Save your planet! With degree of hardness above this, the boss of the 1st stage (the blizzard crawler) laser attack becomes strong. At the time of degree of hardness above this, 6th surface boss 2nd form (the hunter fang) the tentacle under spits the seed bullet, reaches the point where pressure attack from under the land is done. The balun γ which the 7th aspect lastly comes out (the small fish enemy which scatters the bullet), reaches the point where the bullet is shot. Very Hard - Be on your guard! Hardest - Here they come! !